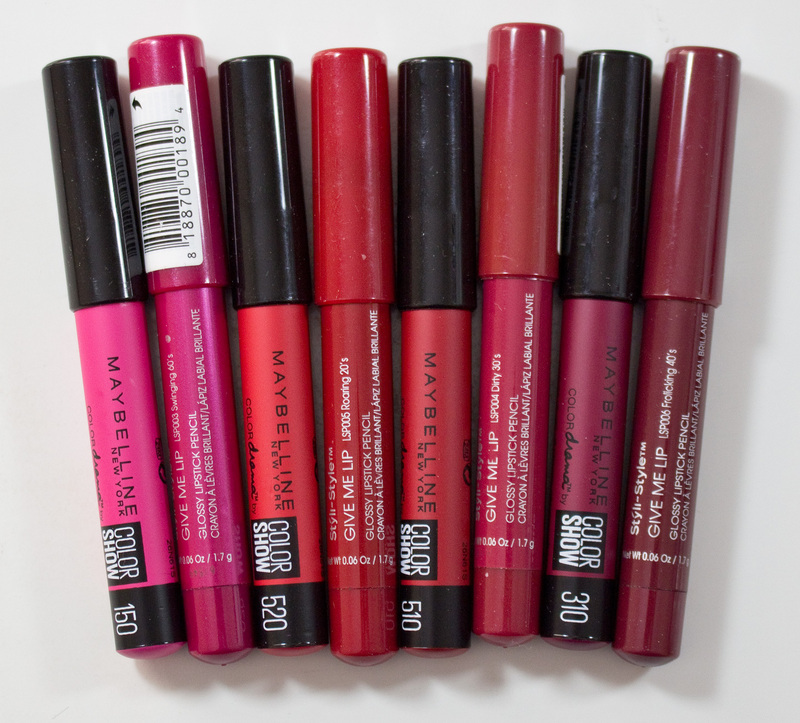 Maybelline Color Drama Intense Velvet Lip Pencil in 310 Berry Much, 510 Red Essential, 520 Light It Up, 150 Fuchsia Desire, & 420 In With Coral. The Maybelline Color Drama Intense Velvet Lip Pencils retail at $9.99CAN at Shopper Drug Mart for an undisclosed amount of product each. I did get 3 of the shades on clearance for $5CAN each. Maybelline Color Drama Intense Velvet Lip Pencil in 420 In With Coral. Back of pencils are all the same. 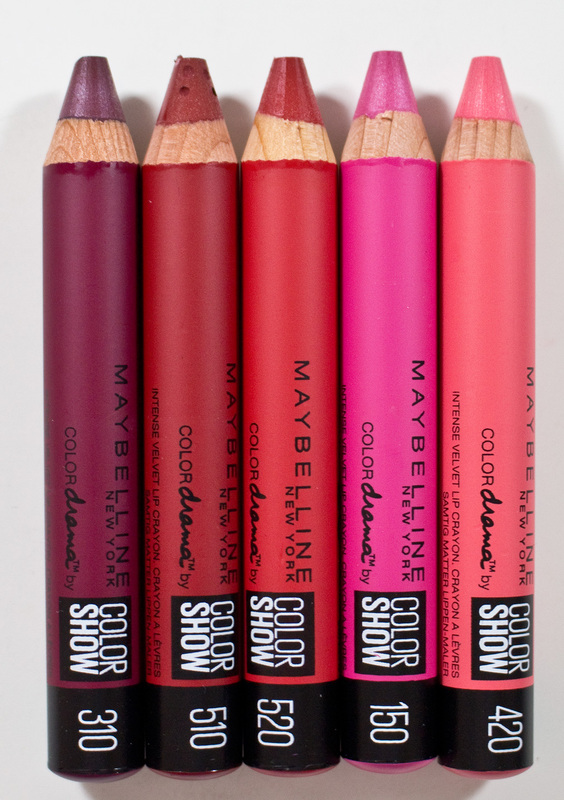 Maybelline Color Drama Intense Velvet Lip Pencil 420 In With Coral ingredients. The Maybelline Color Drama Intense Velvet Lip Pencil formula is a very full coverage lipstick that sets to a cream/satin finish. The formula does very much remind me of the Sytli-Style Give Me Lip pencils but these shade are is more creamy and less matte in finish. 310 Berry Much is a deep berry with a cream finish. 510 Red Essential is a deep warm red with a cream finish. 520 Light It Up is a hot red with a cream finish. 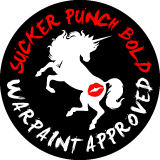 150 Fuchsia Desire is a hot pink with a cream finish. 420 In With Coral is a hot coral pink with a cream finish. Wear: These were close to 6 hours wear. Basic wood pencil that needs to be sharpened with a black cap. Daylight swatches: 310 Berry Much, 510 Red Essential, 520 Light It Up, 150 Fuchsia Desire, & 420 In With Coral. Flash swatches: 310 Berry Much, 510 Red Essential, 520 Light It Up, 150 Fuchsia Desire, & 420 In With Coral. 150 Fuchsia Desire, & Frolicking 40's. Sytli-Style Give me Lip Fabulous 50's is a lot of cool tone compared to 150 Fuchsia Desire. Sytli-Style Give me Lip Roaring 20's id darker and less hot compared to 520 Light It Up. And Dirty 30's is just cooler compared to 520 Light It Up. Sytli-Style Give me Lip Frolicking 40's is darker berry shade compared to 310 Berry Much. I do like the formula of these but I think they are limited edition so get them now might be hard which is why I compared them with the Sytli-Style Give Me Lip pencils for shade options. But I feel like they were put out as an alternative to the Nar Velvet Matte Lip Pencil.